Has your water bill increased? Do you hear the sound of water running in your walls? Do you notice a hot spot on the floor? Have your utility bills gone through the roof? If you answered “yes” to any of these questions – you may have a slab leak. Slab leaks typically occur when the piping underneath your concrete foundation deteriorates, causing pinhole leaks in your plumbing. The concrete foundation of your home acts as only a temporary barrier between the leaking water source and the interior of your home. The sooner you act the better. As water leaks under the foundation of your home, it can rise to the surface causing various types of damage including discoloration, damp spots in carpet, mildew smells, warping of baseboards. 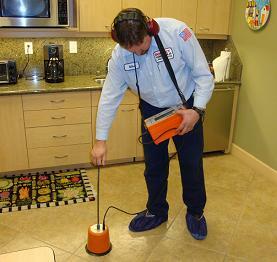 Bonney technicians are specially trained in the use of electronic slab leak detection equipment. 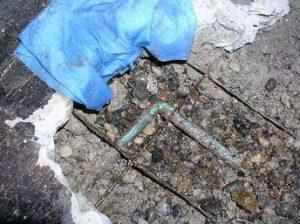 We can accurately locate your water leak and repair the problem, usually in the same day. It is very important to call the most experienced plumbing company with the most sophisticated leak detection equipment available. Look no further. Just call Bonney Plumbing and we’ll find and fix slab and underground leaks using State-of-the-Art electronic leak detection systems and tools. Sometimes the pipe under the slab is leaking in multiple places and is not repairable. In this situation Bonney’s qualified technicians are able to re-route the line or re-pipe your home. You can count on Bonney to do the job affordably and as quickly as possible. You can count on Bonney to be there for you – before and after each job. All work is guaranteed. Financing available.